I just finished sewing the last stitches in the binding of this small wall quilt. This quilt measures 36″ square and is my entry into my Modern Quilt Guild’s Robert Kaufman Modern It Up Challenge. See my previous post here for the rules. Part of the challenge was to take a traditional block and make it modern. 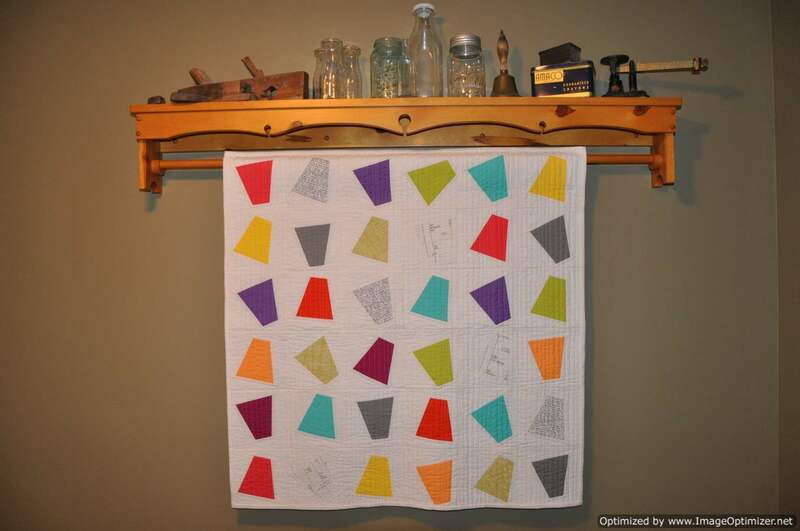 The traditional block that inspired my quilt was the Tumbler block. In a traditional quilt, the Tumbler quilt blocks are arranged side by side, neatly in rows with no space or sashing between the blocks. To make the Tumbler quilt block modern, I used the Missouri Star Quilt Company’s Tipsy Tumbler quilt pattern to add negative space between the blocks and arrange them in a random way across the quilt. My tumblers remind me of a package of gum drops that has been opened and tipped to gain access to the contents so I have called my quilt, Tumbling Gum Drops. My quilt is now officially entered into the Challenge. Keep your fingers crossed that my quilt will be successfully juried into the Creative Stitches Show at the end of March where our Modern Guild will have an information booth. If chosen by the Jury, my quilt will also be part of an exhibit of modern quilts that will be displayed in a quilt show to be held in Penticton from May 8 – 9. This entry was posted in challenge, modern by Norma Hanson. Bookmark the permalink. 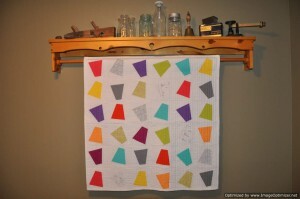 Like the quilts and agree with your comments about value placement on scrap quilts. Good idea for next time. I will definitely keep this in mind when I get around to making my own scrap quilts. I have a grouping of fabrics that I plan on using for testing out patterns. In a few years I should have enough blocks for a sampler quilt. It might be strange as the blocks will be of different sizes. I still plan to do this this idea..as always so many quilt inspirations, so little time! I do love yours ! Love it Norma! Good luck.